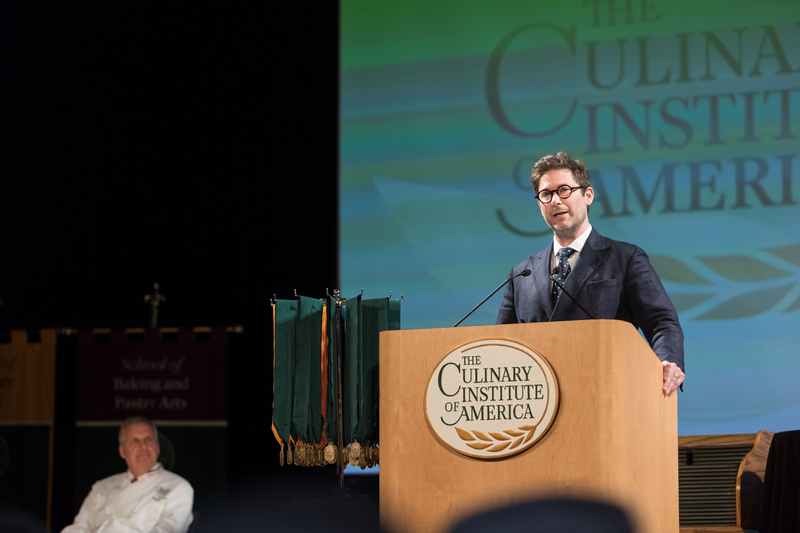 Hyde Park, NY – Thomas Carter, co-owner of one of the world’s best restaurants, delivered the commencement address at the New York campus of The Culinary Institute of America on June 16. The 2004 CIA graduate is a restaurateur who co-owns the New York City-based Matter House restaurant group, which includes Estela, Café Altro Paradiso, Flora Bar, and Flora Coffee. Estela opened four years ago and this year was ranked number 66 in the world on the World’s Best Restaurants list. In 2014, it was nominated for a James Beard Foundation Award for Best New Restaurant and made the Bon Appétit magazine Hot 10 Restaurants list. After earning his bachelor’s degree from the CIA in culinary arts management, Carter cooked at several top-tier New York restaurants, then turned his attention to wine and management. Before partnering with Chef Ignacio Mattos to open Estela and the other Matter House restaurants, Carter was beverage director for Blue Hill at Stone Barns in Pocantico Hills, NY for six years. The entire CIA graduation ceremony, including Carter’s address to 71 recipients of CIA associate degrees in culinary arts and baking and pastry arts, can be seen online.